When I was in the First Grade, my school staged a flower show. It was probably my mom’s idea to use Platón, thinking that his two little barrels would be easy to fill with flowers from our garden, and that his smile was sure to soften up the judges. 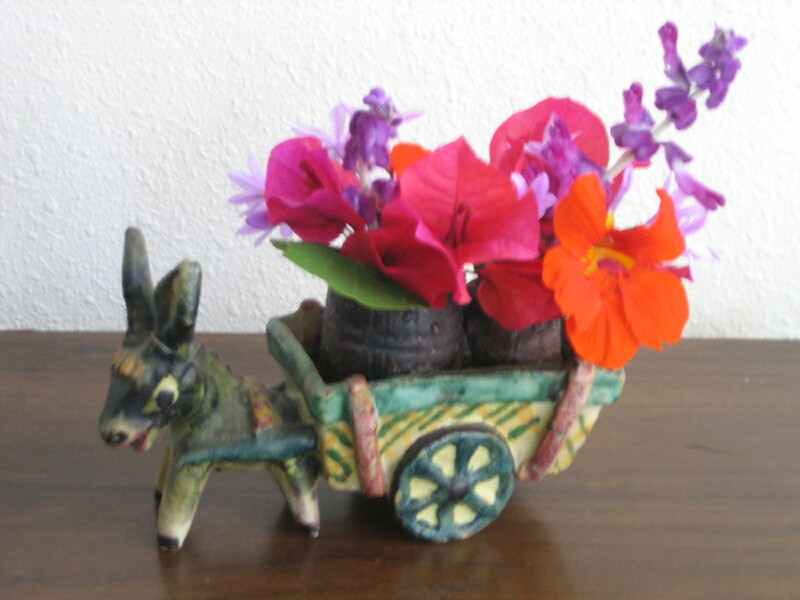 I went out into the yard and picked nasturtium blossoms in orange and yellow, along with a few of their leaves, and carefully filled those two little barrels in Platón’s cart. He then came with me to the school auditorium, where he was set on a long table with the other entries from the First Grade. The next day was the judging, and imagine my thrill when I came back to the table and saw that Platón and I had been awarded First Place!!! I still remember the feeling of accomplishment that gave me, the sense of being recognized for my talents and of having my creativity acknowledged. It was certainly an auspicious beginning for my floral career! I come from a family of serious gardeners, and have been around plants and flowers my entire life. I was lucky to be exposed early on to the joy of growing flowers and vegetables, to see the beauty of nature and learn its rhythms. It’s always been second nature to cut from the garden and fill whatever vase is handy to create my own arrangements, but I never envisioned that I’d build a career as a florist. To this day, my favorite style of arrangement is one that looks like it was just gathered from nature – what we florists call “garden style”. I took a roundabout path to becoming Flaurel Laurel, but it all began in my childhood – in the garden, picking and choosing just the right blooms to fill Platón…..